Presenting here the list of Pahari Sanyal songs in alphabetical order (song title). 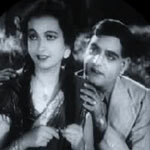 We have one song sung by Pahari Sanyal in our collection. All of these are listed below with the link to song's lyrics, audio & video.